Do you miss Pong? Do you have the Chrome browser? Yesterday, Google released a game called Cube Slam as its latest Chrome Experiments. The newest game Google’s Roll It Skee-Ball, Cube Slam’s built with WebRTC, which lets you conduct video chats without needing to install any plug-ins. Whether you play with a friend or against the computer, it’s a fun way to relive an old school arcade game with new school technology. When you play with a friend, video chat is enabled so you can see your opponent as if you were on opposing sides of a ping pong table. You can chat during the game or between rounds while watching the monochromatic forest and hills around the arena. There’s even a group of friendly (?) bears watching the game. If you’re short on friends, Bob the Bear steps in as the computer opponent. The game works like this: use the left and right arrow keys to move the bar at the bottom of the screen. Hit the cube with the bar to try and smash your opponent’s screen three times. There are bonuses and obstacles that appear on the playing field to navigate the cube around, too, making the game more difficult than it seems at first. Hit your opponent’s screen three times and it shatters into a mess of cubes. Get hit three times and your screen flickers and melts. 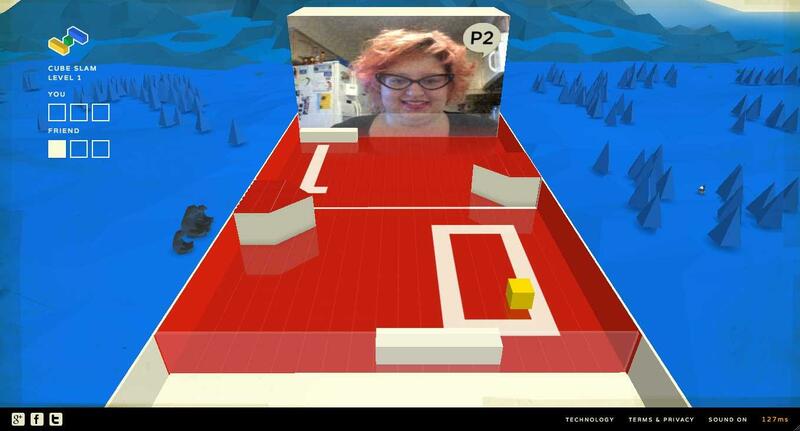 The idea behind Cube Slam is to show how the WebRTC commands work in the context of game. Specifically, Cube Slam is the first game to use the RTCDataChannel command, which transfers data via a peer-to-peer network to keep the game in sync. Offline play is available against Bob the Bear as a downloadable Chrome app, which is accessible on your desktop and on your phone or tablet. Google says it’s planning on releasing a mobile version of the game later this year. Try it out with your friends at cubeslam.com and let us know what you think!